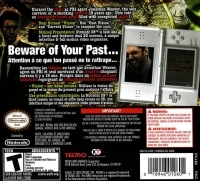 Box Text: Unravel the clues as FBI agent Jonathan Weaver, the sole survivor of a shocking murder 19 years ago. Dive into an interactive crime novel filled with unexpected twists! Dual Screen "Vision": Use "Past Vision" and "Current Vision" to examine the case. Stylized Presentation: Nintendo DS is held like a novel and features dual 3D screens, a unique interface & full-motion video sequences. 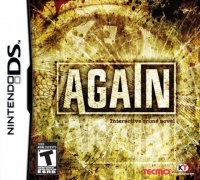 This is a list of VGCollect users who have Again: Interactive Crime Novel in their Collection. This is a list of VGCollect users who have Again: Interactive Crime Novel in their Sell List. This is a list of VGCollect users who have Again: Interactive Crime Novel in their Wish List.